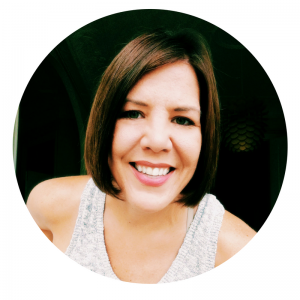 Sometimes the less you know the better, it cuts down on disappointment if it’s not what you expected and if it’s great, then you’re pleasantly surprised! Before leaving for dinner Harris quickly read aloud the story of 4 Gats from their website. 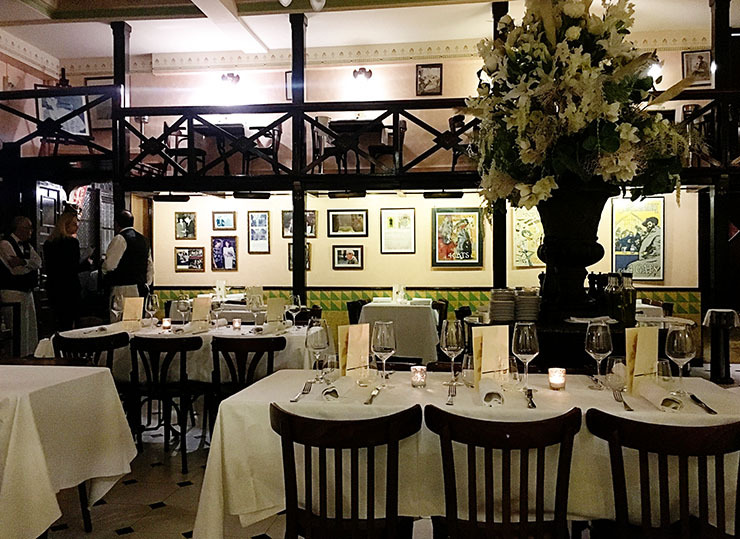 I was sort of listening, but I was finishing up dinner for the kids so I really only heard two things – the restaurant dates back to 1897 and it is where Pablo Picasso had his very first art exhibition. As we walked up to 4 Gats I realized I have walked by this building many times, not even realizing it was El Quatro Gats (gats is Catalan for cats). 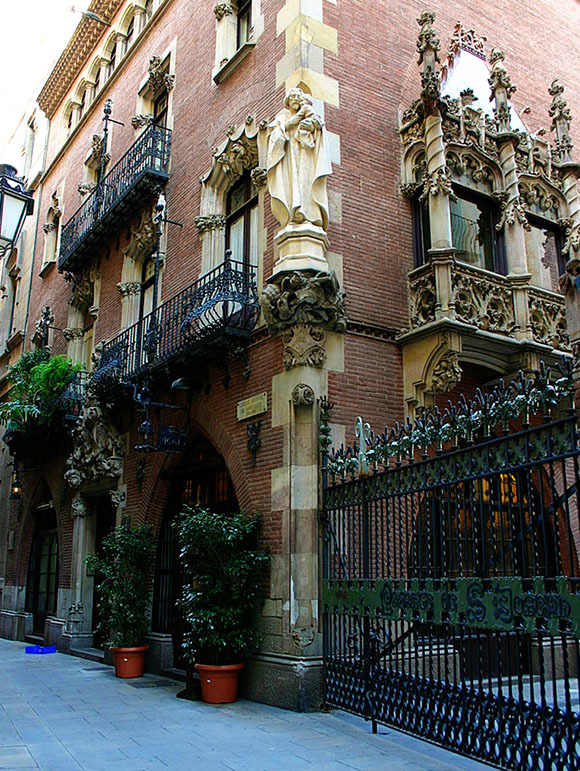 The design of the building is gorgeous and has its own importance, Casa Marti, a modernista building designed by Catalan architect Josep Puig i Cadafalch. If you happen upon this building while wandering around Barcelona it will definitely grab your attention. There is a statue mounted on the corner and one of the most elaborate balconies you’ll ever see. You surely can’t miss it. 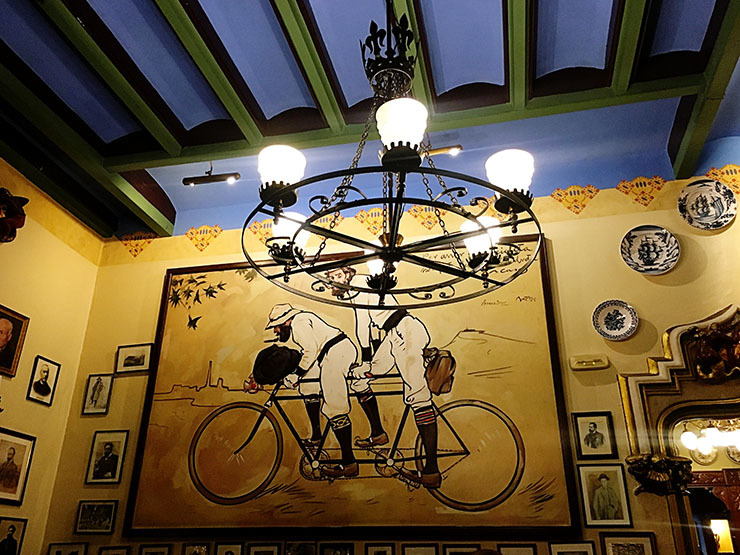 Els Quatre Gats was founded by the Catalan artist Roman Casas and opened on June 12th 1897. It was a bar, restaurant and social club that was inspired by Le Chat Noir, the bohemian nightclub in Paris. It was a meeting place for emerging artists, architects, musicians, intellectuals and even some politicians. A young Pablo Picasso was known to hang out at 4 Gats and had his very first art exhibition in the main room. Barcelona’s beloved Antoni Gaudí was seen here on occasion as well. 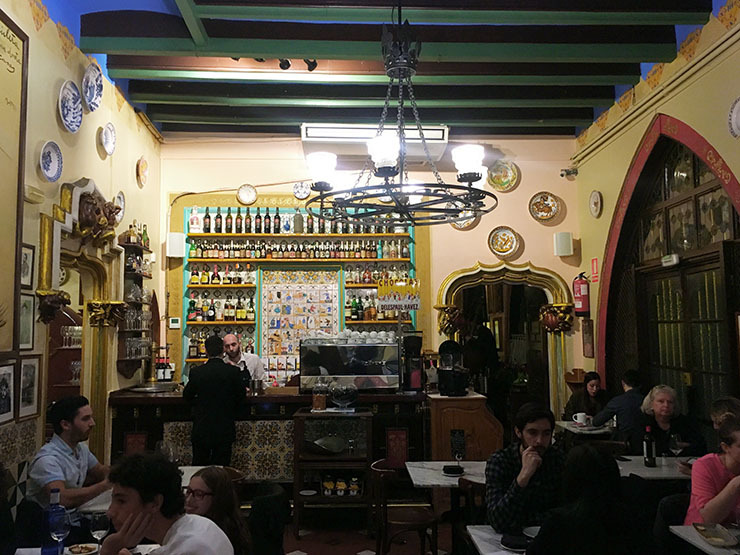 We made a dinner reservation for 7:00pm (early for Barcelona) but when we arrived the hostess politely told us that the restaurant does not open until 8:00pm, and she had made a mistake over the phone. She sat us at a small table in the front room and offered us some complimentary Cava. This actually turned out to be for the best, because Harris and I were on a date after all, not need to rush! So we sat and sipped our pre-dinner Cava and I really enjoyed the vibe of the front room, it was like sitting in a funky little art history book. 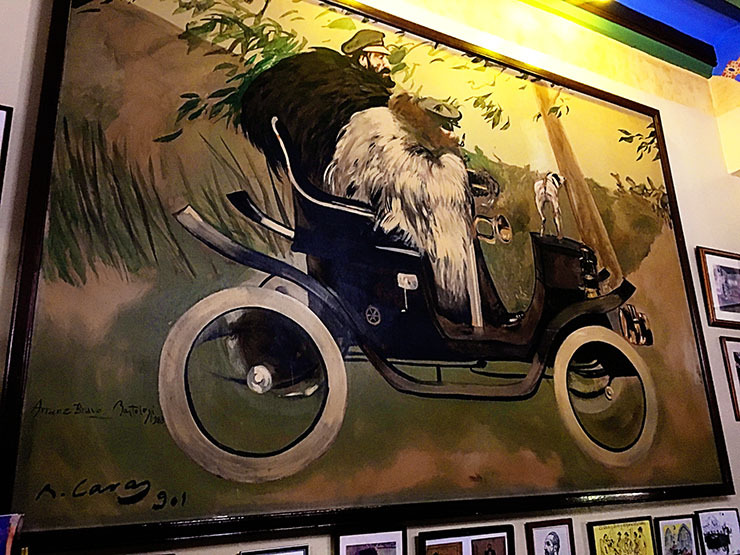 There are two reproductions of Roman Casas paintings that hang on the wall at 4 Gats. One is “Ramon Casas and Pere Romeu on a Tandem” and the other is “Ramon Casas and Pere Romeu in an Automobile”. The original paintings are over at Barcelona’s Museu Nacional d’Art de Catalunya. 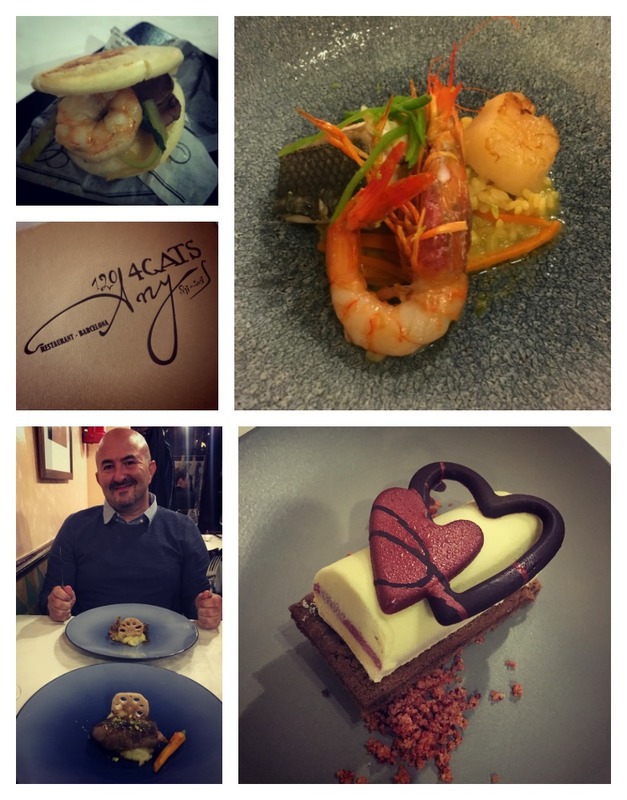 For Valentine’s Day they had a special six course tasting menu, which we didn’t know about – but we loved it! It was a lot of seafood, but all of the dishes were so fresh and delicious. By the time the last one arrived, which was steak and mashed potatoes, I was actually pretty full. Then to end the night they brought out the sweetest dessert, which was a bit like an ice cream cheesecake pastry of some sort, it was fantastic, but I was so full from all the courses that I couldn’t even finish it! 8:00pm is early for dinner Barcelona, but there were about six other tables with couples there and more started to trickle in around 9:00pm and the front room was actually full as we were leaving. The service was great and I even admired the variety of blue plates they used for each course. After our meal they told us to relax and stay awhile, but it was now 9:30, on a Tuesday, our kids were home alone and we needed to get back to make sure they had brushed their teeth. I can imagine a place like 4 Gats can get a bit touristy at times, but lucky for us we were able to see this place very light on the tourists (February is not exactly high season here). I would highly recommend visiting 4 Gats even if you only stop in for a cappuccino or glass of Cava in the front room. Although, based on our sampling menu, I’d recommend dinner too!